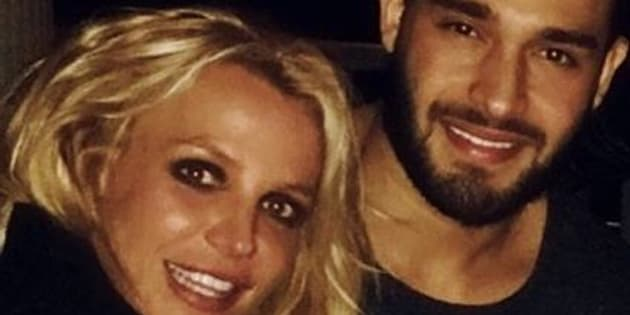 Model Sam Asghari appears to be Britney Spears’ New Year’s resolution. On Sunday, the singer posted a photo of herself getting cozy over a meal with her rumored boyfriend. Asghari has his arm around her and they sure look together. “Happy New Year,” the caption reads. Asghari has been a love interest of Spears’ before ― in her “Slumber Party” video, where he played a mysterious man approached by the pop star on a long table. But there have been strong signs that Asghari and Spears are indeed a real-life couple. A photo of the two apparently in bed together, pictured with animated reindeer ears and antlers, recently appeared on Asghari’s Instagram story. And according to Us Weekly, the two generated relationship scuttlebutt when they dined at a Los Angeles restaurant in November. Asghari shared ― and then deleted ― a fun photo of the moment showing Spears with her tongue out.